Your premier source for legal solutions, including WestlawNext and law books. Takes the Guesswork Out of Financial Planning for Divorce. FinPlan Divorce Math releases an update each year to update tax information and arrearage interest rate requirements, plus any other changes or enhancements as needed. This software includes 16 basic calculators accessible through one screen of options. The basic 16 include: Pension and retirement valuations, future and present values, sale of home, alimony recapture, Social Security/Medicare, and loan amortizations. Also available are two additional modules: Arrearage Calculator and a Parenting Time Calendar. Divorce Math goes beyond simply performing basic calculations, but rather translates results into understandable reports. Each calculator provides detailed information to quickly determine the best settlement arrangements for your clients. Divorce Math may be used in any state. Select from state-specific dropdowns from within calculator as needed. Available free with all Divorce Planner purchases. Select a calculator - All 18 calculators appear on one screen for quick selection. Enter variables - Fields for entry are basic and simple, but the calculations behind the scenes are complex, simplifying the user's experience. Print reports - Each calculator allows you to print a report to assist in negotiating the best settlement for your client. Purchase the additional 2 calculators to quickly identify the amount owed on an arrearage based on your own state's rules. Or, create a parenting time schedule for your client with pre-set arrangements or customize your own while seeing immediately how many overnights and percentage allocations are selected for those states where shared parenting means less or more child support. See why so many family law professionals rely on Divorce Math with quick and accurate results for settling family law matters relating to divorce and child support. See the power behind FinPlan Divorce Math by reading the Online Help. Learn quickly on how to use the FinPlan Divorce Math software by viewing a flash demo tutorial for the basic 16 calculator and the advanced demo for the arrearage calculator and parenting time calendar. The official citation style for citing FinPlan is: FinPlan Divorce Math (Thomson Reuters, version 20XX.X) (Software). Replace the X's with the version number. The version number can be found in the Help/About screen on the software. 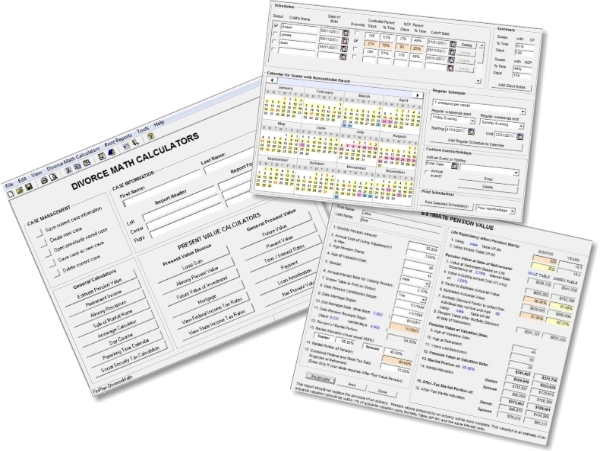 FinPlan software is a suite of family law calculators offered in several states, that aid in calculating after-tax cash availability and planning, financial affidavits, marital property distribution and commonly used calculations, such as Pensions, Retirement, Present and Future Value, and Alimony Recapture. Click below to learn more about the software and find answers to frequently asked questions.